A pivot table is a special type of summary table that’s unique to Excel. Pivot tables are great for summarizing values in a table because they do their magic without making you create formulas to perform the calculations. Pivot tables also let you play around with the arrangement of the summarized data. It’s this capability of changing the arrangement of the summarized data on the fly simply by rotating row and column headings that gives the pivot table its name. 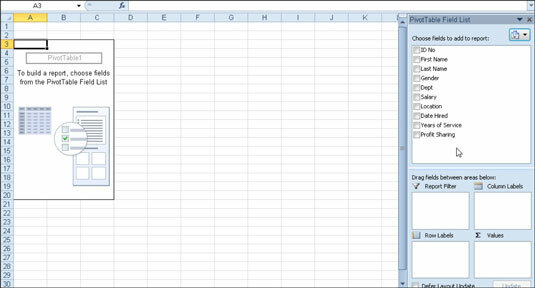 Open the worksheet that contains the table you want summarized by pivot table and select any cell in the table. Ensure that the table has no blank rows or columns and that each column has a header. Click the PivotTable button in the Tables group on the Insert tab. Click the top portion of the button; if you click the arrow, click PivotTable in the drop-down menu. Excel opens the Create PivotTable dialog box and selects all the table data, as indicated by a marquee around the cell range. If necessary, adjust the range in the Table/Range text box under the Select a Table or Range option button. 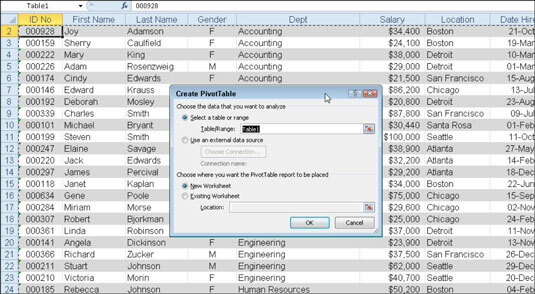 If the data source for your pivot table is an external database table created with a separate program, such as Access, click the Use an External Data Source option button, click the Choose Connection button, and then click the name of the connection in the Existing Connections dialog box. Select the location for the pivot table. By default, Excel builds the pivot table on a new worksheet it adds to the workbook. If you want the pivot table to appear on the same worksheet, click the Existing Worksheet option button and then indicate the location of the first cell of the new table in the Location text box. Indicate the data source and pivot table location in the Create PivotTable dialog box. Excel adds a blank grid for the new pivot table and displays a PivotTable Field List task pane on the right side of the worksheet area. The PivotTable Field List task pane is divided into two areas: the Choose Fields to Add to Report list box with the names of all the fields in the source data for the pivot table and an area divided into four drop zones (Report Filter, Column Labels, Row Labels, and Values) at the bottom. New pivot table displaying the blank table grid and the PivotTable Field List task pane. Report Filter: This area contains the fields that enable you to page through the data summaries shown in the actual pivot table by filtering out sets of data — they act as the filters for the report. So, for example, if you designate the Year Field from a table as a Report Filter, you can display data summaries in the pivot table for individual years or for all years represented in the table. Column Labels: This area contains the fields that determine the arrangement of data shown in the columns of the pivot table. Row Labels: This area contains the fields that determine the arrangement of data shown in the rows of the pivot table. Continue to manipulate the pivot table as needed until the desired results appear. Completed pivot table after adding the fields from the employee table to the various drop zones. Field List to hide and redisplay the PivotTable Field List task pane on the right side of the Worksheet area. +/- Buttons to hide and redisplay the expand (+) and collapse (-) buttons in front of particular Column Fields or Row Fields that enable you to temporarily remove and then redisplay their particular summarized values in the pivot table. Field Headers to hide and redisplay the fields assigned to the Column Labels and Row Labels in the pivot table. 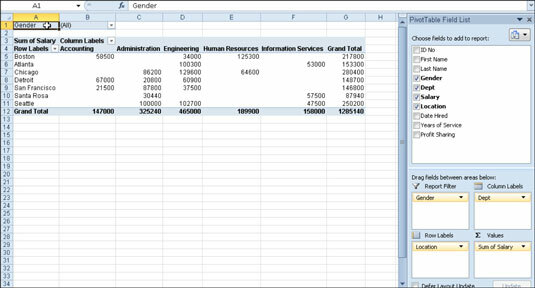 Did this glimpse into Excel pivot tables leave you longing for more information and insight about Microsoft’s popular spreadsheet program? You’re free to test drive any of the For Dummies eLearning courses. Pick your course (you may be interested in more from Excel 2010), fill out a quick registration, and then give eLearning a spin with the Try It! button. You’ll be right on course for more trusted know how: The full version’s also available at Excel 2010.